Amid aggressive expansion by Chinese TV makers in the liquid-crystal display TV market, LG Electronics is moving to strengthen its leadership in the premium LCD TV market, according to the industry on Monday. Although LG has gained more attention with its organic light-emitting diode TVs in recent years, the company still takes a major share of the LCD TV market. It plans to expand its market share and launches new lineups featuring upgraded technologies each year. Out of the total of 218.8 million units of LCD TVs shipped globally last year, those by Korean TV makers LG and Samsung Electronics accounted for 67 million, or 30.6 percent, according to IHS Markit. For the first time, Chinese TV makers outdid Korean companies with 31.2 percent of LCD TV shipments. To differentiate itself from Chinese LCD TV makers, LG is highlighting its proprietary Nano Cell display technology and deep learning algorithm platform Deep ThinQ for its premium LCD TV lines. 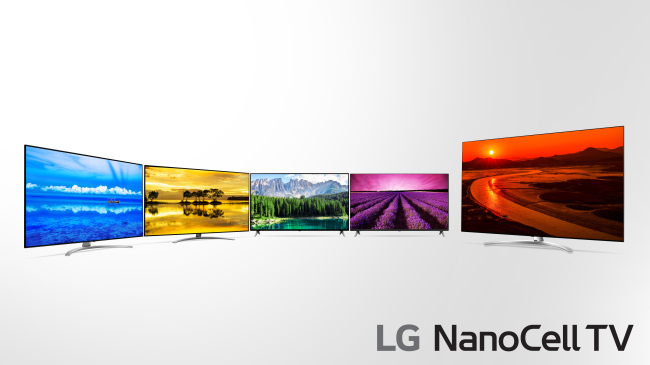 The LG Nano Cell TV has fine particles of about 1 nanometers that precisely tune color waves on the LCD panel, which minimizes distortion in the accuracy of colors and picture quality at any viewing angle. The latest model is equipped with the second generation of the Alpha 7 processor, which helps raise picture and sound quality. LG has cut prices for its LCD TV models by around 20 percent this year, with the aim of maintaining its share of the LCD market. In the Korean market, a 75-inch Nano Cell TV costs 5.5 million won ($4,810), while a 65-inch size is priced between 2.49 million to 2.99 million won. In the second half of the year, LG will launch an 8K LCD TV model along with an 8K OLED TV. The Nano Cell technology is optimal for 8K displays, and the company will expand launches of large-size LCD TVs over 70 inches throughout the year. In a survey by Choice, an Australian consumer magazine, the LG Nano Cell TV grabbed the top spot among 10 LCD TVs by Samsung and Sony, with a total score of 86 points in terms of high definition picture, standard definition, remote and sound quality.